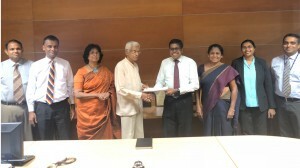 After a very successful completion of two DRR programmes with the Hatton National Bank (HNB) which started in January 2017in Aranayake, SLWP signed an agreement for the 3rd programme on 16th October 2018 at the HNB Towers, Colombo. This is a joint activity in the tea landscape in the central region undertaking a sanitation programme for marginalized schools in the tea sector. The programme provides for building better health and sanitation awareness in estate sector youth population, including SDG 6 Sensitization of the school community and provision of Rain Water Harvesting (RWH) systems to water deprived estate schools and control of ODA in catchment areas close to Hatton through SDG 6 sensitization. The initial visits and survey is scheduled for end of October 2018, with programme set to conclude by March 2019.